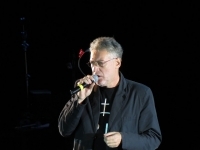 TALLINN - The ideology of the Estonian Conservative People's Party (EKRE) is not influenced by Nazism, but the Soviet legacy, Artemy Troitsky, Russian music critic, journalist and political activist, who now resides in Estonia, said. "It seems to me that parties such as EKRE are a burp not of Nazi influence, but of Soviet isolationism. It is rather a party that has inherited the Soviet mentality," Artemy Troitsky told the the online publication Fontanka.ru. "On the one hand, this party is ultra-nationalist -- it is in favor of isolationism in Estonia, opposes globalization and international cooperation, NATO and particularly the European Union. They want foreigners to be expelled from the country, and call on everyone to take up residence in the country and organize their lives in accordance with traditional values," Artemy Troitsky said. "No other Estonian party is known to have as a high a share of former communists as EKRE. Arnold Ruutel, who was the latest first secretary of the Communist Party of Estonia, is the party's honorary chairman [Ruutel never actually lead the Communist Party of Estonia, but was part of the party's management and a long-term chairman of the Presidium of the Supreme Council of the Estonian SSR -- BNS]," Artemy Troitsky said. "Former Nazis, however, are long gone. All this propaganda about Waffen-SS processions is absolute nonsense. There are some freaks and non-formals, but each country has them, Russia included," Troitsky said, when asked if Nazism has any influence on Estonia's internal politics. "Nazism existed in Estonia for four years -- from the summer of 1941 to the fall of 1944. And I cannot say that it had any influence on the Estonian society. Soviet power existed from 1939 to 1991 and that influenced the whole way of life," Troitsky added. Artemy Troitsky, who is critical of the current authorities in Russia, moved to Estonia with his family in 2014. It is not the first time Troitsky has expressed criticism towards EKRE. In an interview to Eesti Paevaleht in November 2018, Troitsky called the party a tool of the Kremlin.